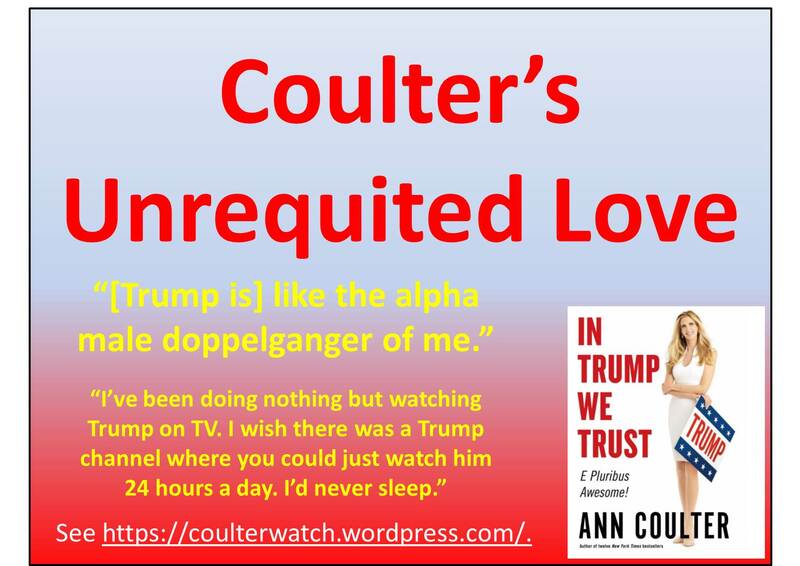 Ann Coulter’s latest, deepest, and most sorrowful love is Donald Trump. 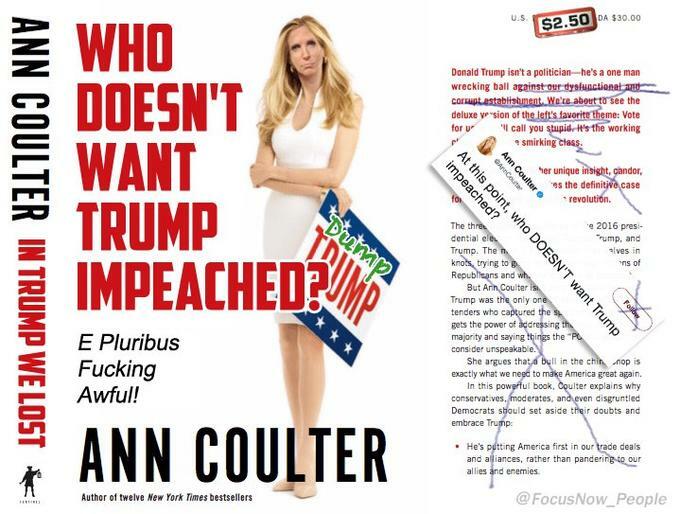 In what could be termed a lovers’ spat, on the very day of Coulter’s book launch, Trump sabotaged her paean to him by betraying the central premise of her book and its raison d’etre. Trump flip-flopped on immigration. Did Trump pick that particular moment in time due to political expediency or to reverse his abysmal poll numbers? Or was it, perhaps, something more personal – a battle between two unyielding narcissists. Ego vs. ego. Narcissist vs. narcissist. Ann does not take rejection well. 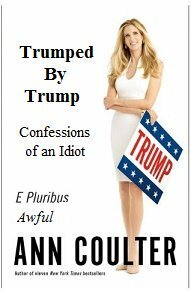 Ann Coulter, Opie & Jimmy Show, 8/22/16. 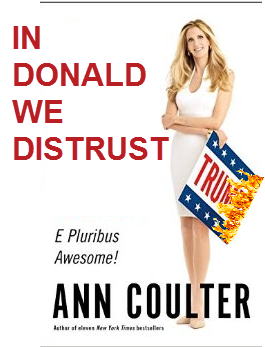 Ann Coulter, Federalist Radio, 6/17/15. 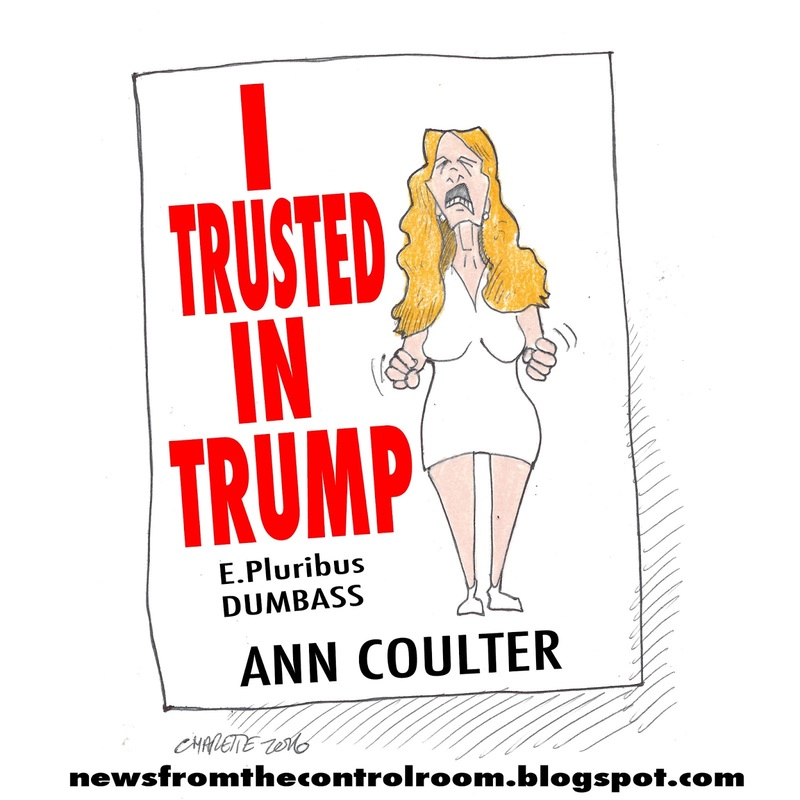 Ann Coulter, Drive at Five, WMAL, 7/7/15. 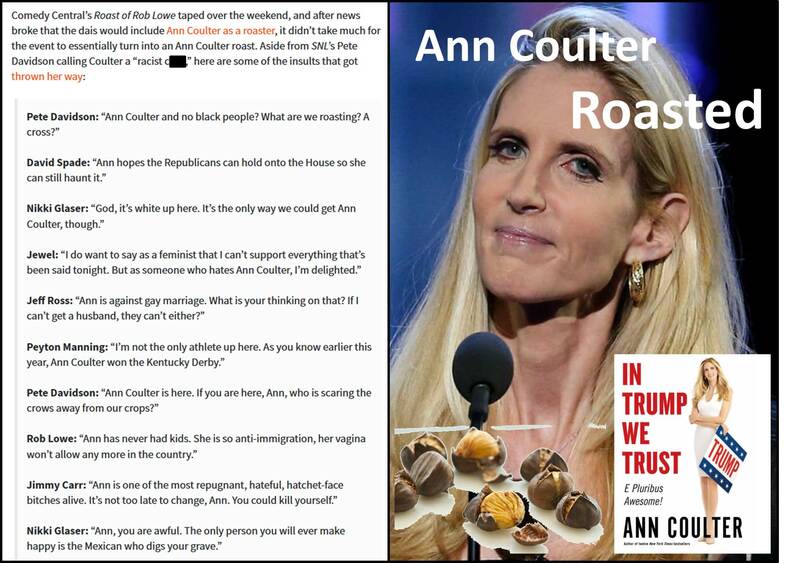 Polemicist Ann Coulter was roasted at Comedy Central’s Roast of Rob Lowe (see graphic). 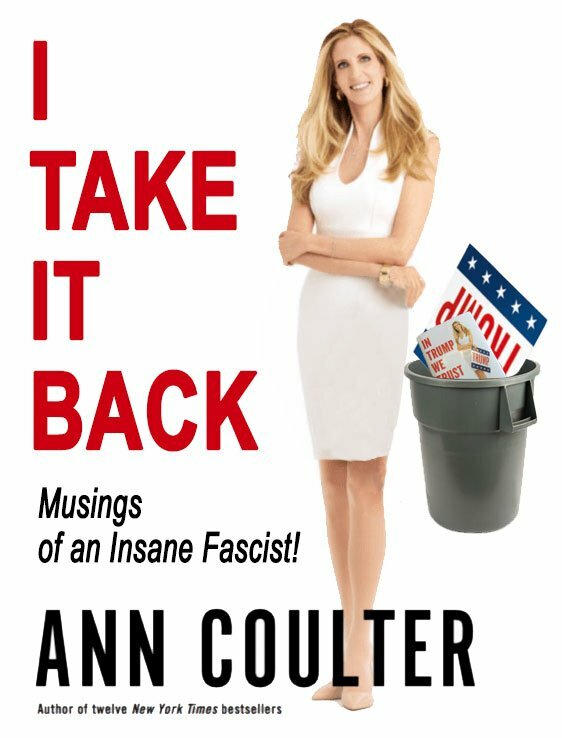 While Coulter has not lost her edge, she has lost her relevancy. 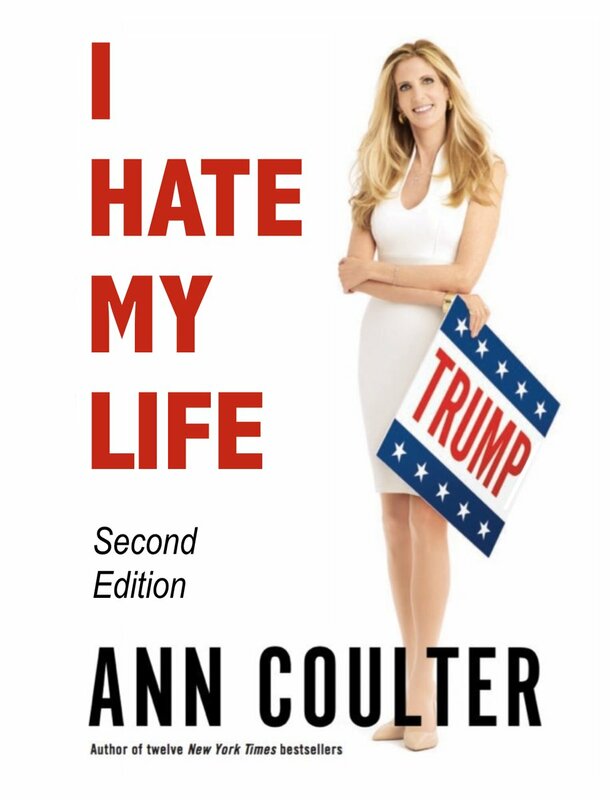 More and more frequently, conservatives have come out against Coulter. 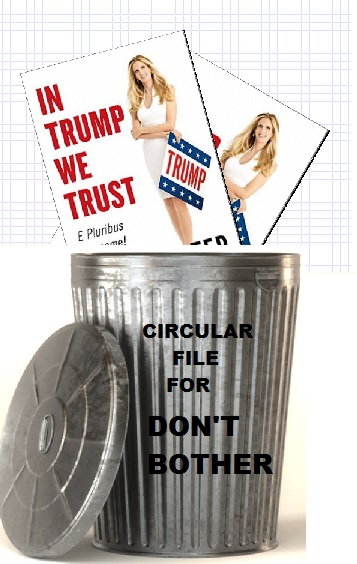 Since 9/11, many conservatives have frequently found fault with the substance and style of Coulter’s work, as well as with her integrity and veracity. 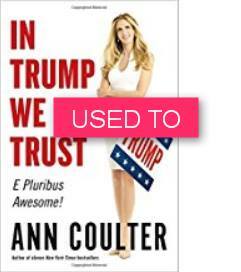 In fact, conservative criticism of Coulter has increased dramatically in recent years. 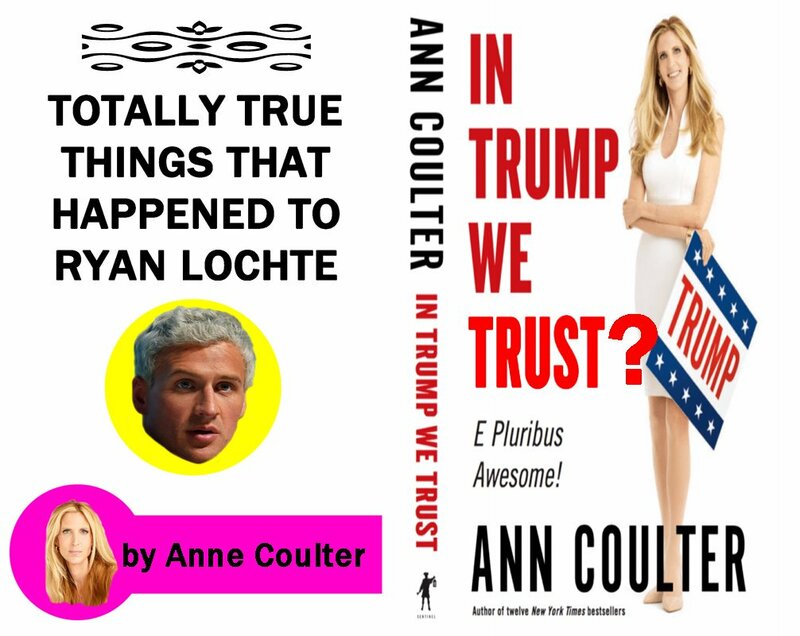 Her current book, In Trump We Trust, has been completely undermined by her subject and savior, Donald Trump himself, prompting a slew of parody book covers. 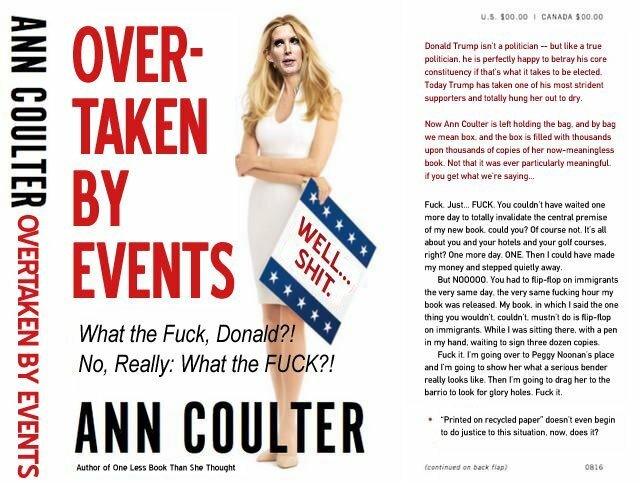 Coulter actually exhibited the five stages of grief in less than 36 hours. 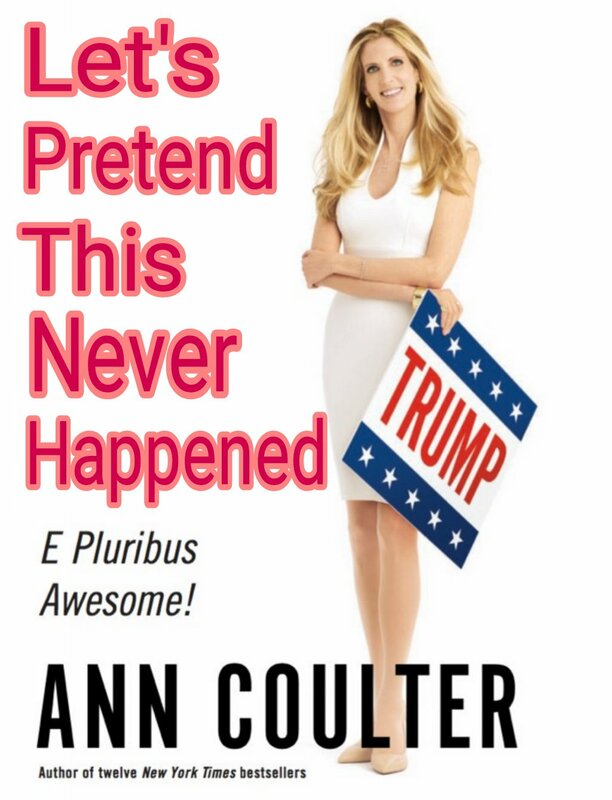 Coulter has become an expert at one thing: turning herself into a parody. 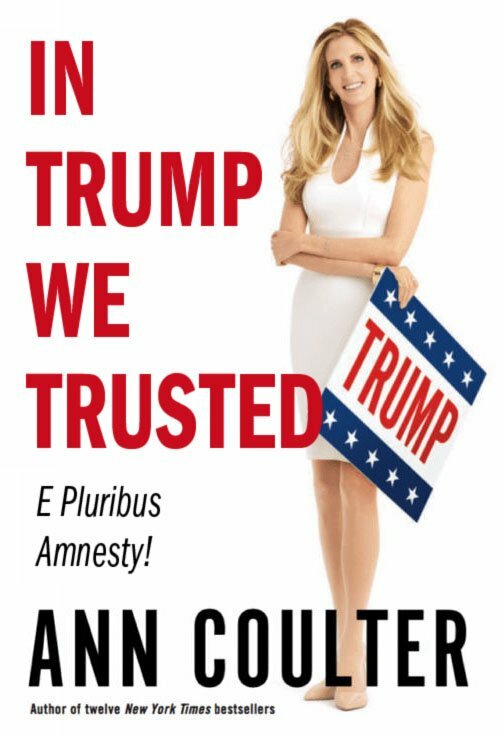 Donald Trump sabotaged Ann Coulter’s paean to him by betraying the central premise of her book and its raison d’etre. 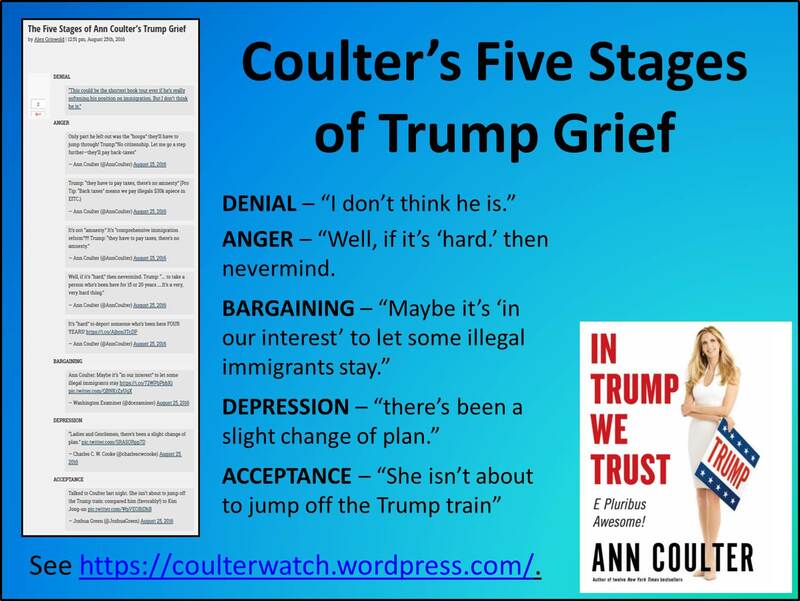 Alex Griswold at Mediaite observed that in less than 36 hours, Coulter exhibited the five stages of grief. 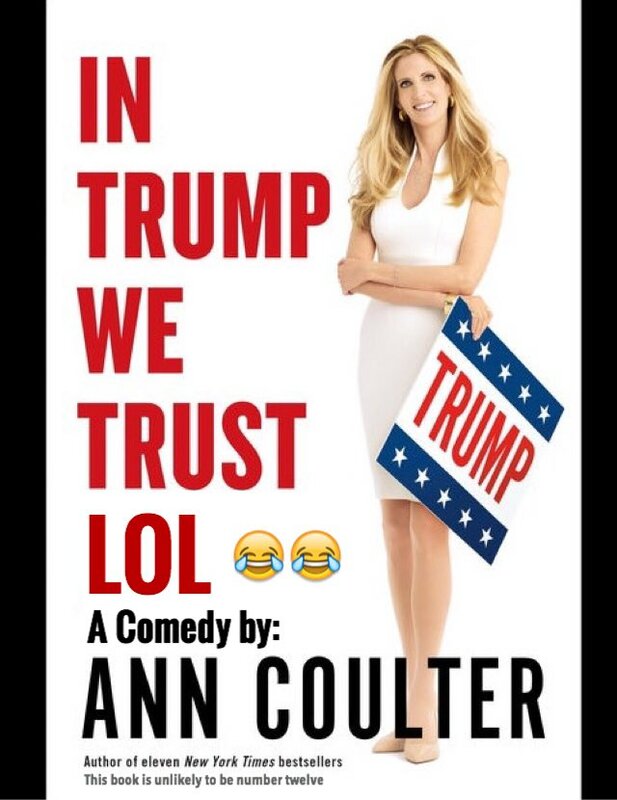 Few people are as worthy of mocking as Ann Coulter. 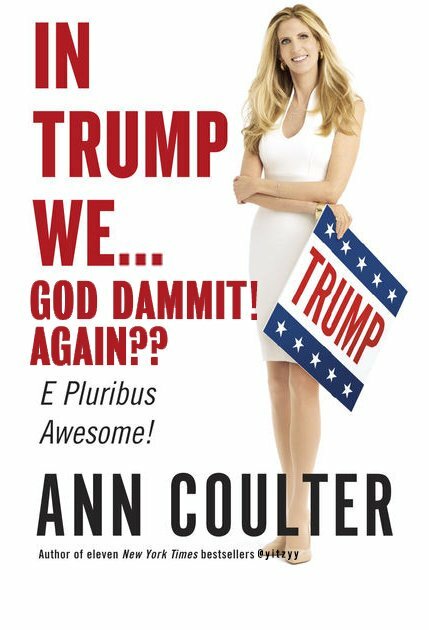 Add to that her latest book worshipful of the eminently mock-worthy celebrity Donald Trump and you have a recipe for delight. 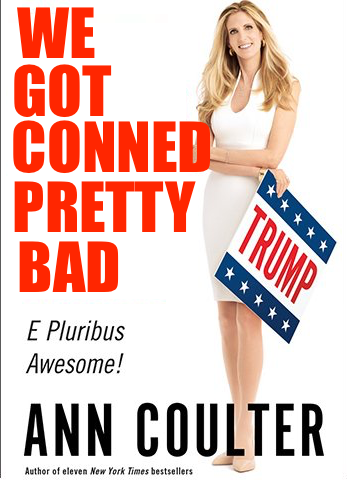 Posted here are a few parodies of Coulter’s book cover for your amusement. Unless otherwise noted, they were obtained on the Internet. You are welcome to add your own to this collection. 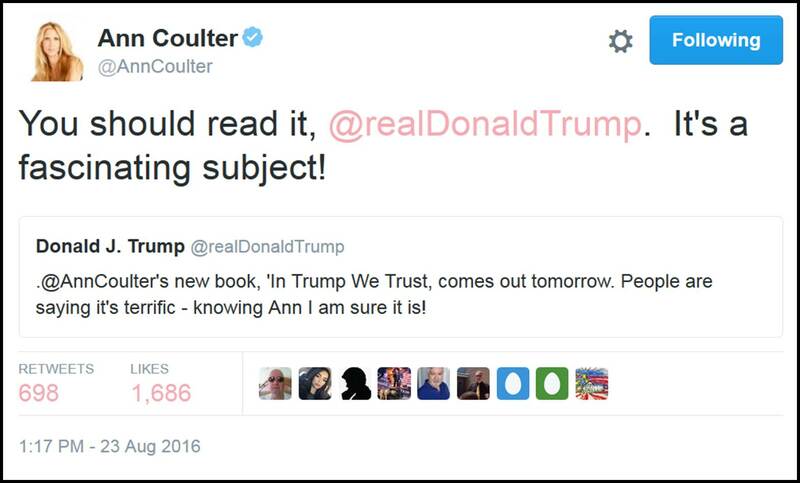 Donald Trump hasn’t read Ann Coulter’s book about him. A book worshipful in tone and glorifying in substance. 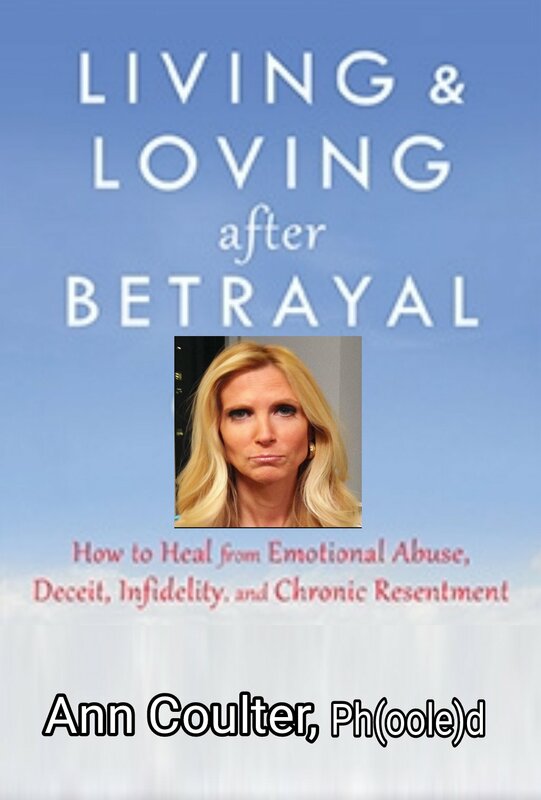 A book written by one narcissist to another narcissist. 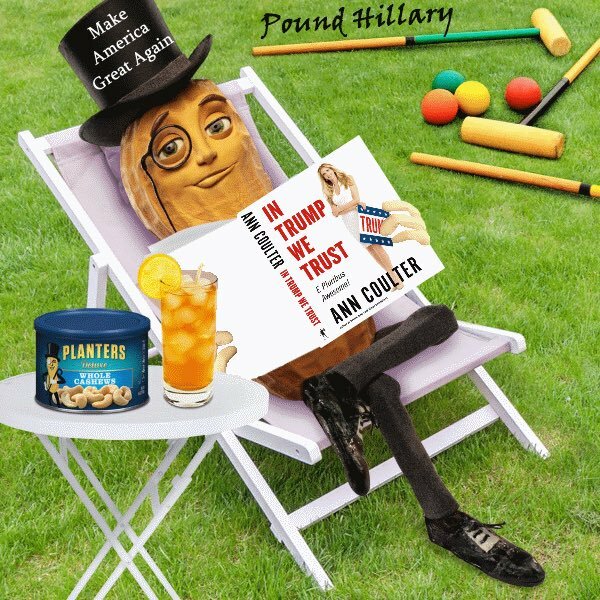 A book written by his former consigliere who is known affectionately as Trump’s Brain. And Trump hasn’t read it. While many Americans seek to #DumpTrump, perhaps this is the beginning of a #TrumpDump. 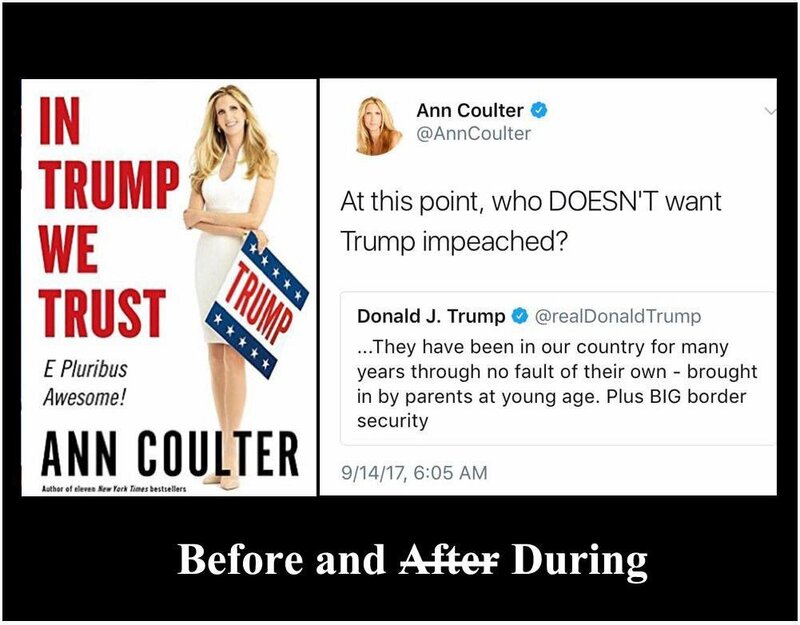 Ann Coulter spoke those words on August 22, 2016. Long after San Bernardino and Orlando. Long after Paris, Brussels, Istanbul, and Nice. According to FBI counterterrorism expert Dr. Sebastian Gorka, there have been 109 ISIS attacks in America in the last two years. 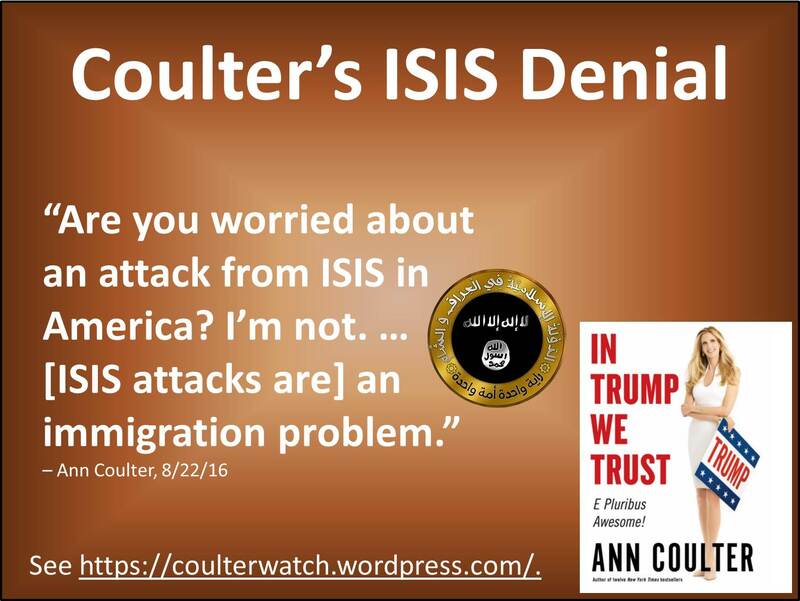 Coulter has repeatedly denied (again, and again, and again, and again, and again, and again, and again, and again) the threat that ISIS poses to Americans in America. 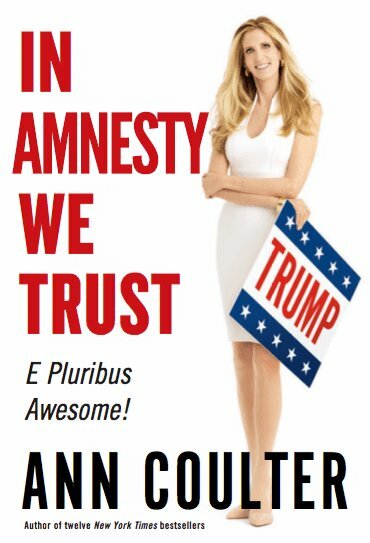 Forgetting the terrorism, Coulter blithely charges ahead with her anti-immigration agenda and rejects every effort to deal with those terrorists and would-be terrorists who are already here! 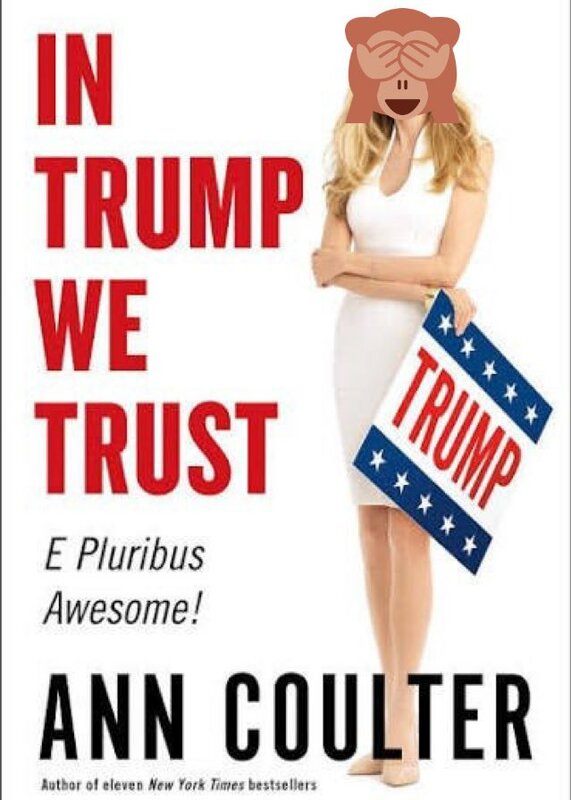 If Coulter’s entire immigration plan was put into effect, it would not prevent terrorist attacks from jihadists or radicalized Americans who are already here. A moratorium on all immigration – which is her favorite proposal – would do absolutely nothing to address the jihadist threat currently entrenched in America. Under Coulter’s plan, American citizens who have lived in America for decades and been radicalized to jihad would remain in America. As for the 9/11 hijackers, guess how many were immigrants? None! One entered the U.S. on a student visa, the remainder on tourist or business visas. Emulating Obama, who dismisses the ISIS threat and refuses to even name Islamic terrorism, Coulter dismisses the ISIS threat and refuses to acknowledge its existence in the heartland of America. 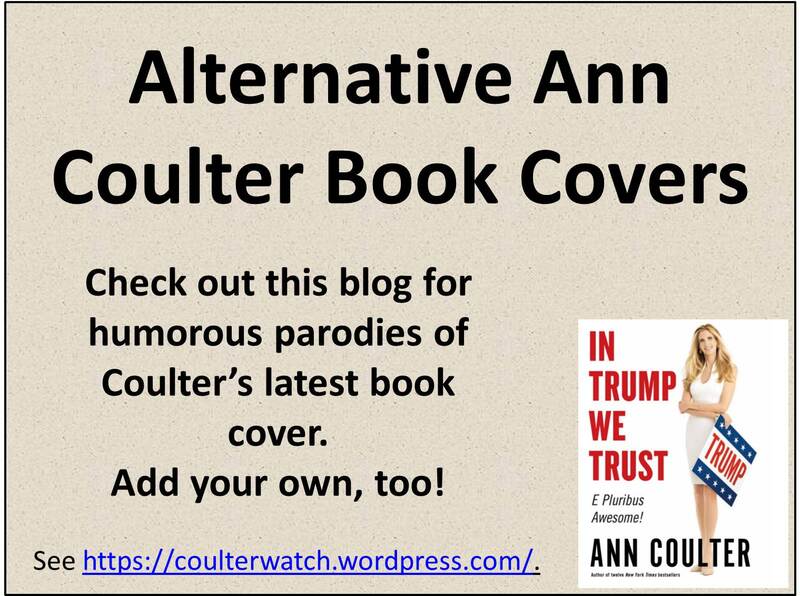 Coulter is acting as a Quisling isolationist. Ann Coulter, Opie & Jimmy Show, Sirius XM, 8/22/16. Dr. Sebastian Gorka, Drive at Five, WMAL, 8/23/16. 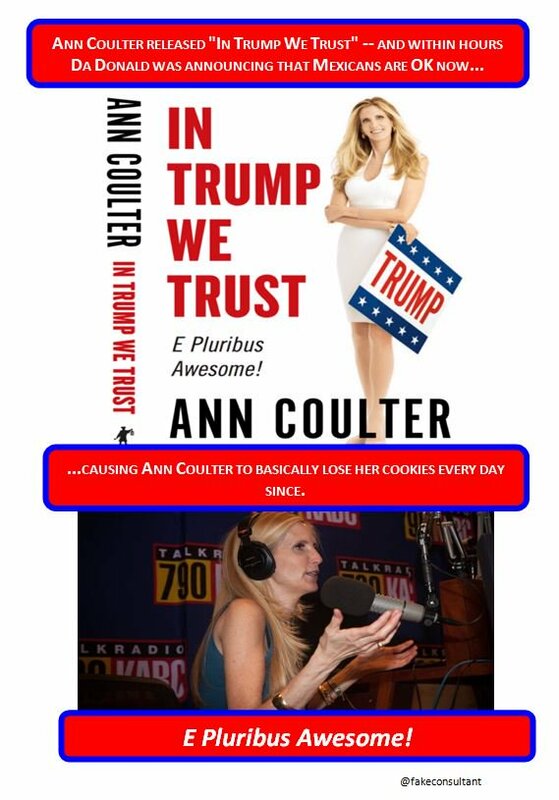 See “Coulter Denies Islamist Threat” at http://wp.me/p4jHFp-69. 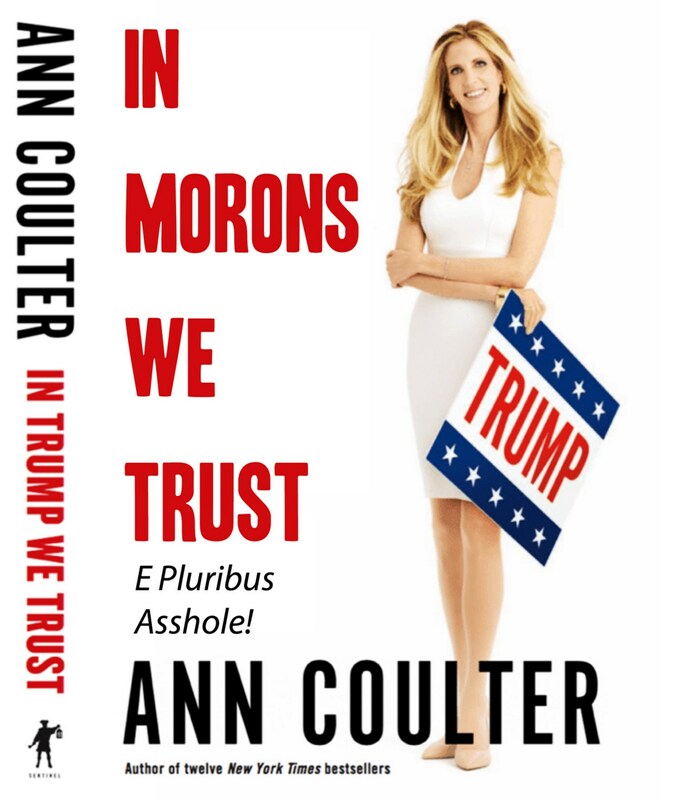 See “Adios, Ann: Fear Mexicans, Not Jihadists” at http://wp.me/p4jHFp-6A. 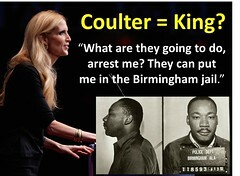 See “Ann Coulter … Dangerously Wrong!” at http://wp.me/p4jHFp-7x. 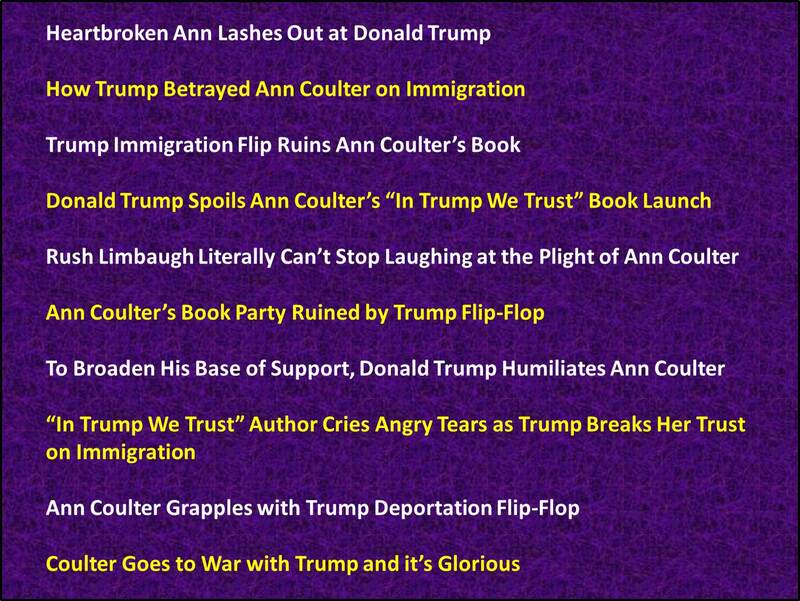 See “Coulter Flips Out, Again!” at http://wp.me/p4jHFp-aH. See “Stop Immigrants, Not Terrorists!” at http://wp.me/p4jHFp-b2. 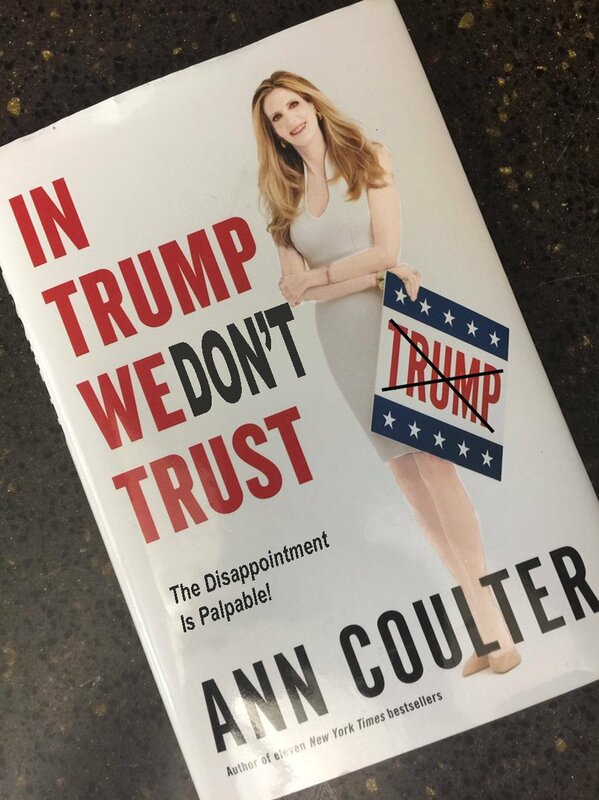 See “Coulter Still Doesn’t Get Terrorist Threat!” at http://wp.me/p4jHFp-bg. 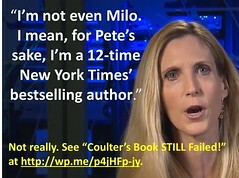 See “Coulter, Orlando, & Nonsense!” at http://wp.me/p4jHFp-eL. 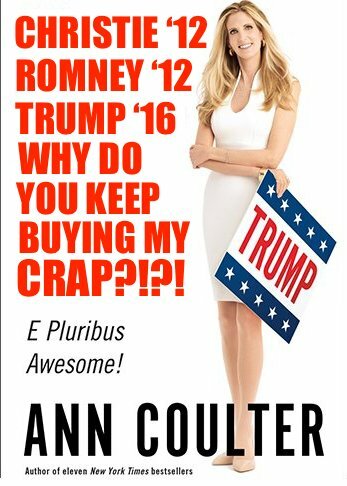 Ann Coulter just made a fool of herself. Again. 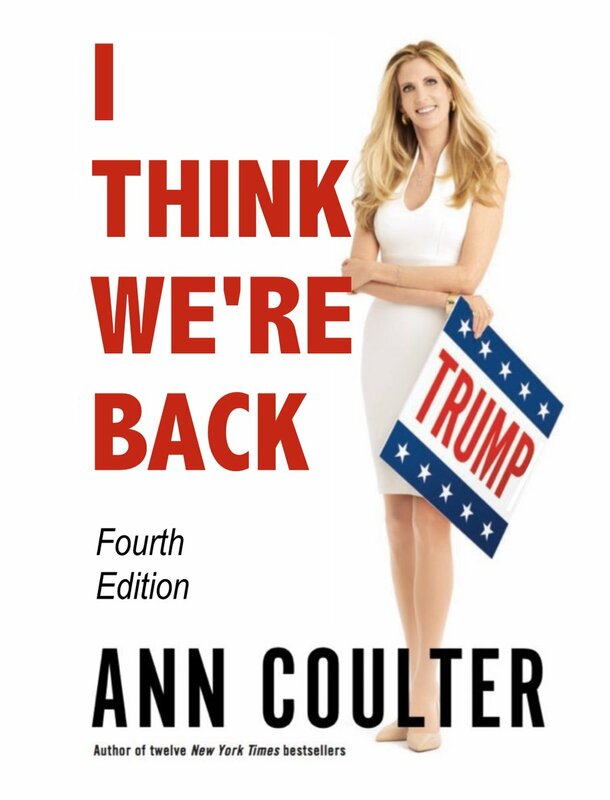 This time Coulter defended Donald Trump’s mocking of a disabled journalist, using four rather obtuse and irrational arguments: 1) that Trump was doing “full-on spastic retard” (which is perfectly acceptable in her eyes) and not mocking a “journalist with disabilities,” 2) that the disabled journalist deserved to be mocked, 3) what we plainly see on video is not really what we see, and 4) we have been brainwashed into instantly believing everything bad the media says about Trump. Coulter made these four arguments on the Opie & Jimmy Show (8/22/16). 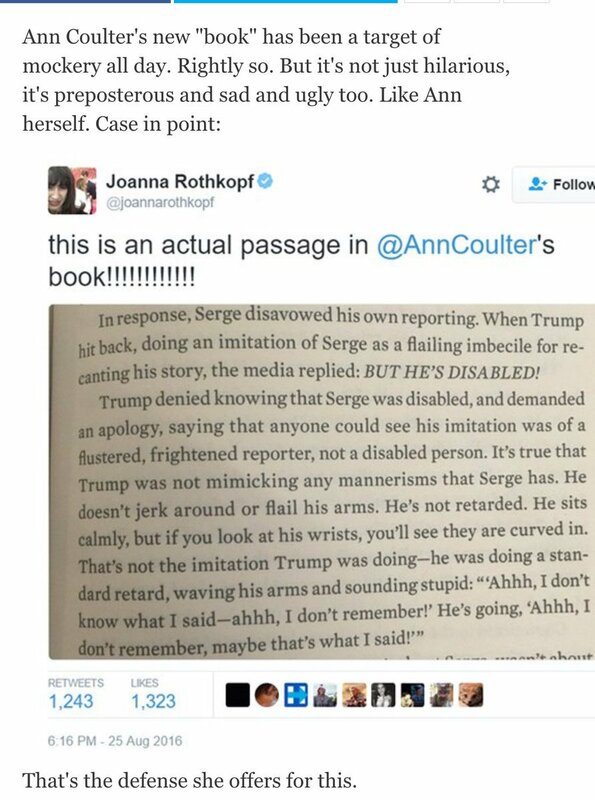 Yes, Coulter’s defense of Trump for mocking a disabled reporter is that he was really just mocking a generic retarded person. 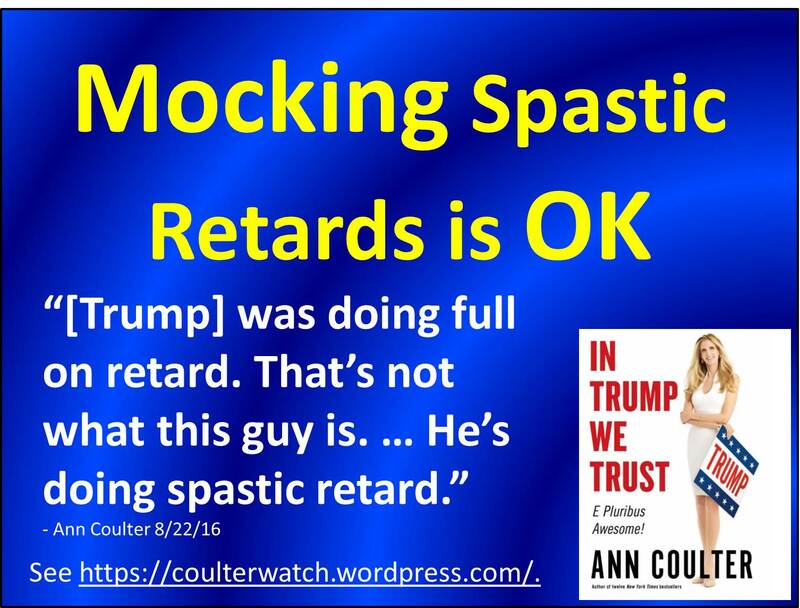 Moreover, Coulter insists that calling people retarded and mocking them thusly is perfectly acceptable behavior. 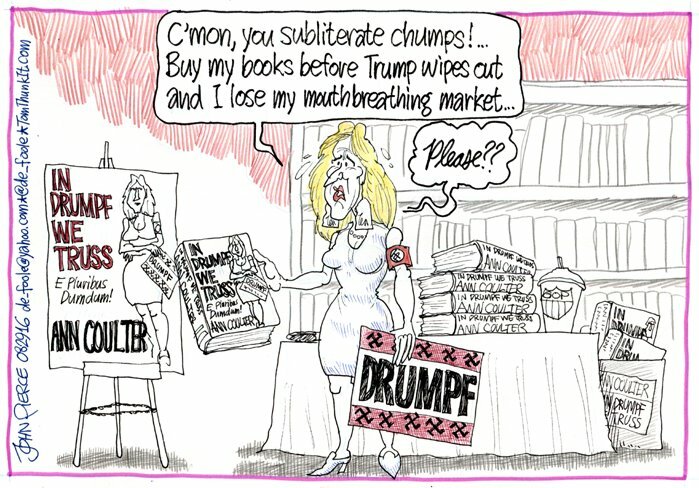 Coulter is wont to use the R-word without hesitation. 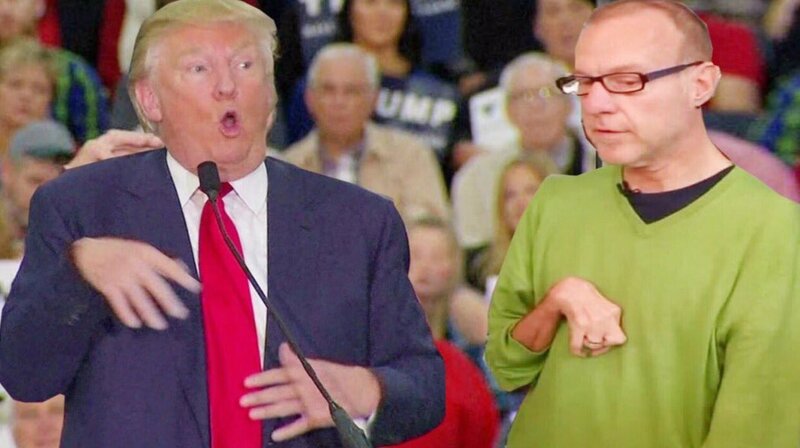 Coulter argued, “He’s not making fun of a guy’s disability but if he were, he deserves it.” Why did the disabled journalist “deserve” to be mocked with a “full-on spastic retard” routine? Because he lied about Trump. 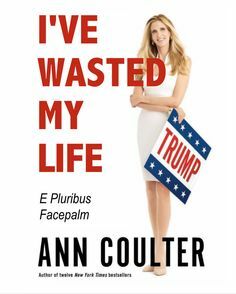 Readers may recall that Coulter also sided with the victimizer and attacked the victim in a well-reported case of physical assault by Trump’s campaign manager, Corey Lewandowski, on reporter Michelle Fields. 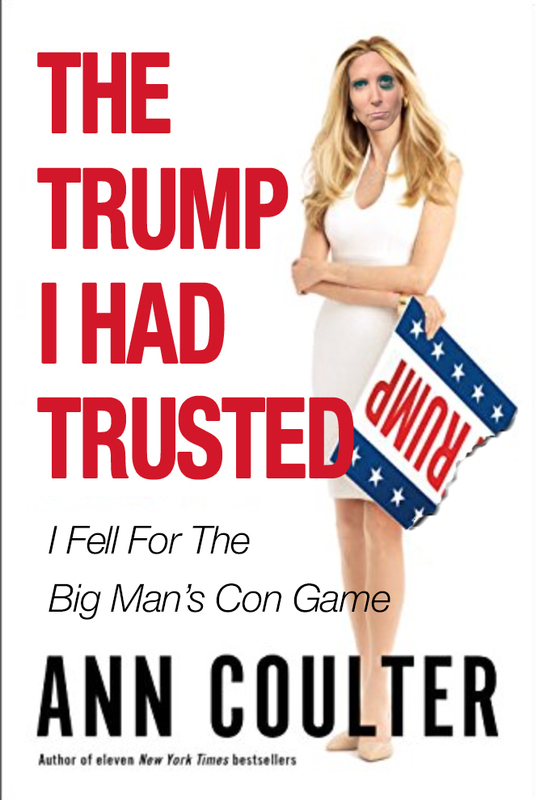 Coulter went so far as to ridicule Fields by jokingly claiming that she (Coulter) had been gang-raped. George Orwell accurately portrayed how propagandists operate. 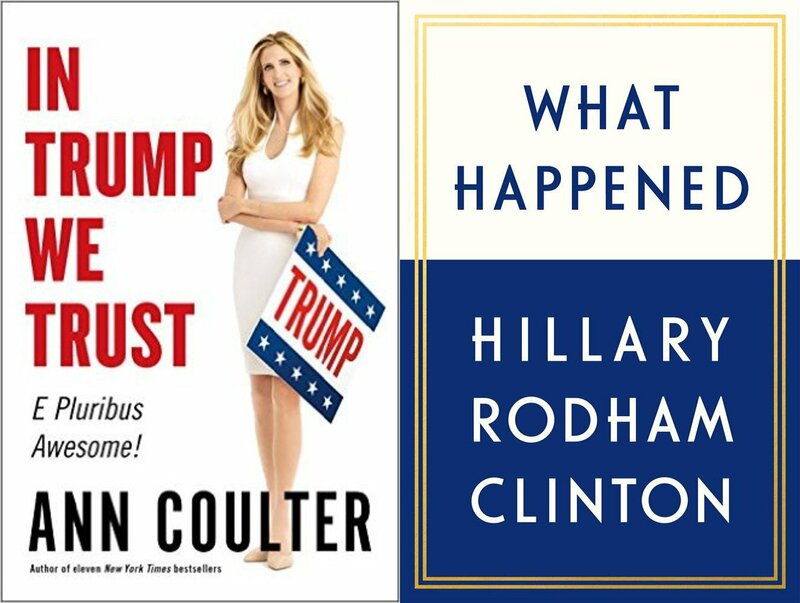 Likening the mainstream media in America to Pravda, Coulter claimed that the American people have become so brainwashed that they immediately succumb to whatever the particular lie of the moment might be. 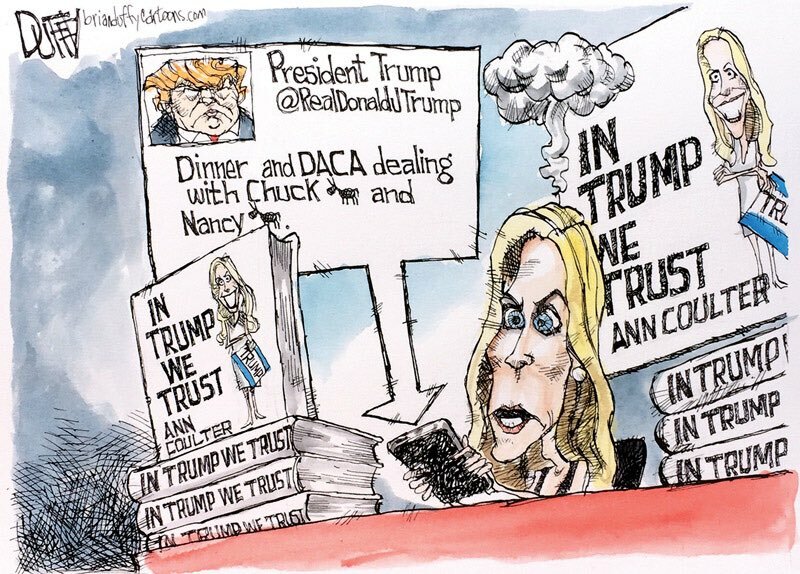 Coulter asserted that the co-hosts had become so brainwashed by media bias that they were incapable of accurately interpreting the very clear video that they were viewing. 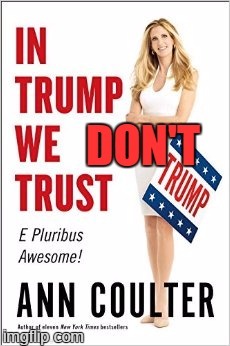 Coulter’s message: You can’t think for yourself. Let me tell you what you should believe. 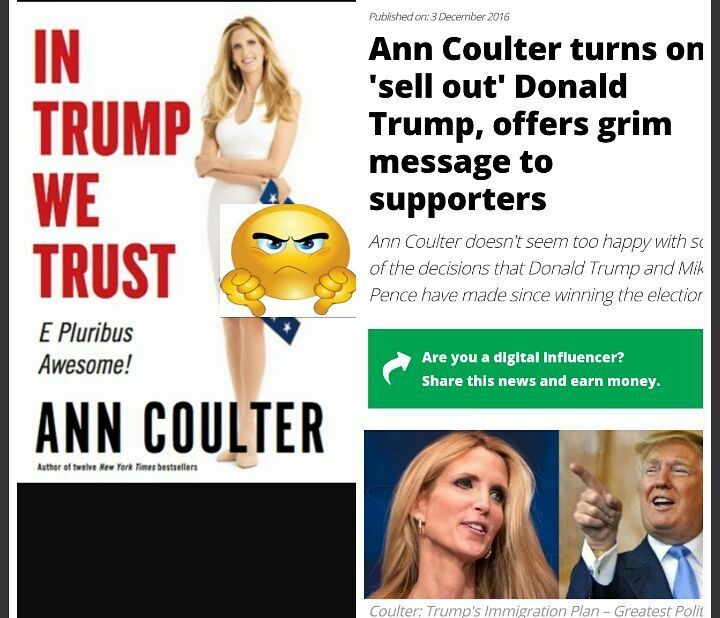 But, since we can’t trust Coulter, why should we trust Trump? 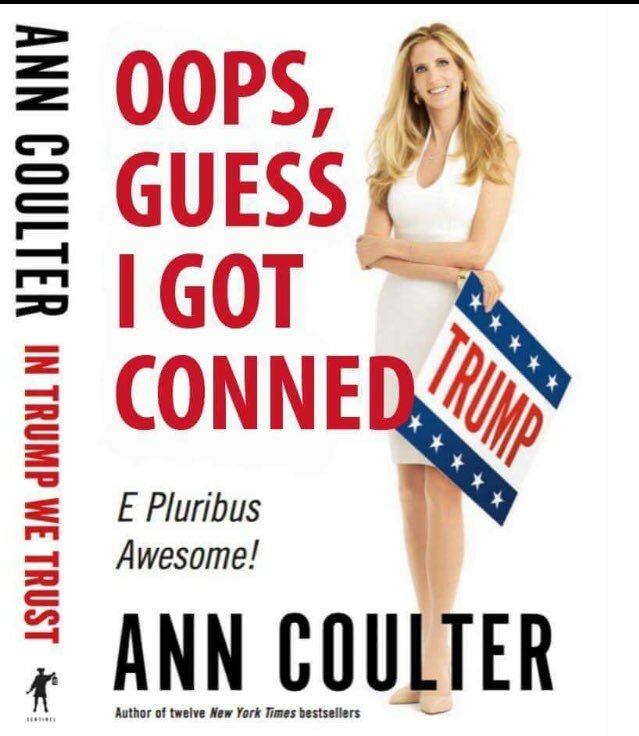 See “Ann Coulter, Bimbo” at http://wp.me/p4jHFp-bS. 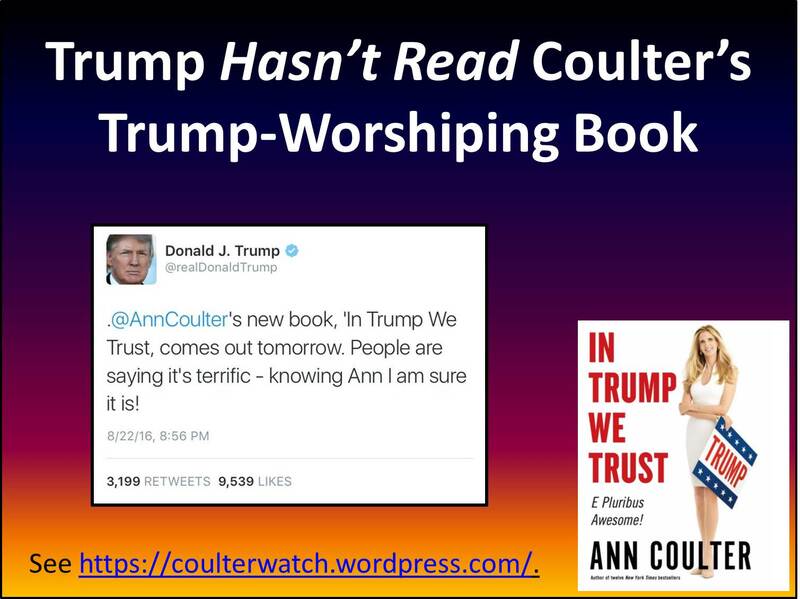 See Chapter 4, “… Brains,” The Beauty of Conservatism, available as a free download at www.coulterwatch.com/beauty.pdf. 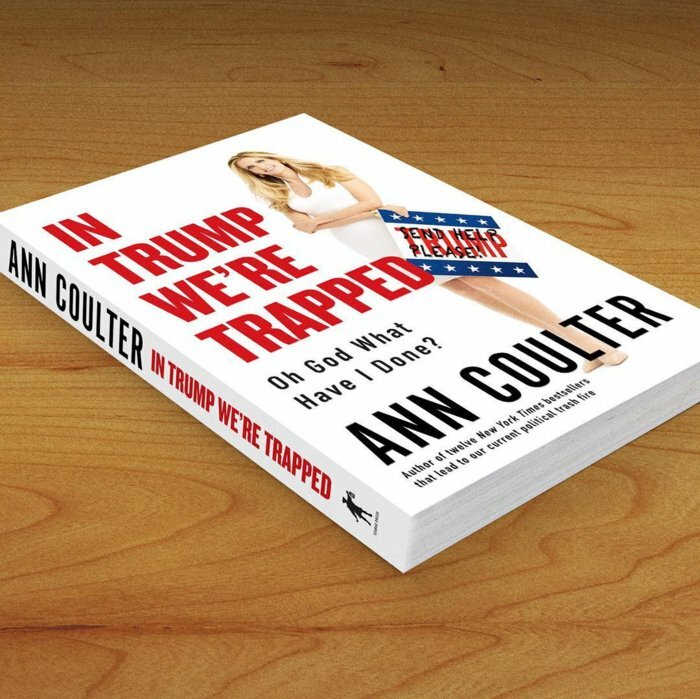 See “Ann Coulter Was Gang Raped!” at http://wp.me/p4jHFp-dp. 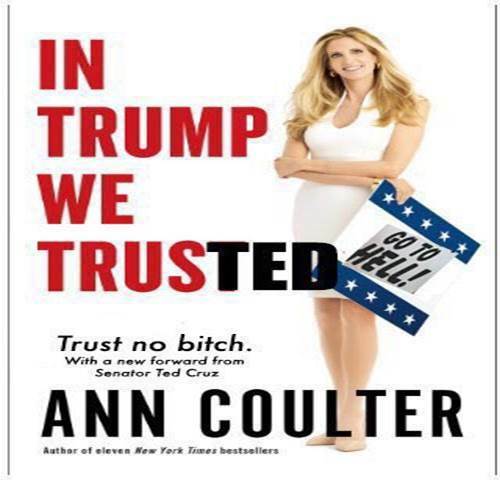 See “Ann Coulter = Leni Riefenstahl” at http://wp.me/p4jHFp-5w. 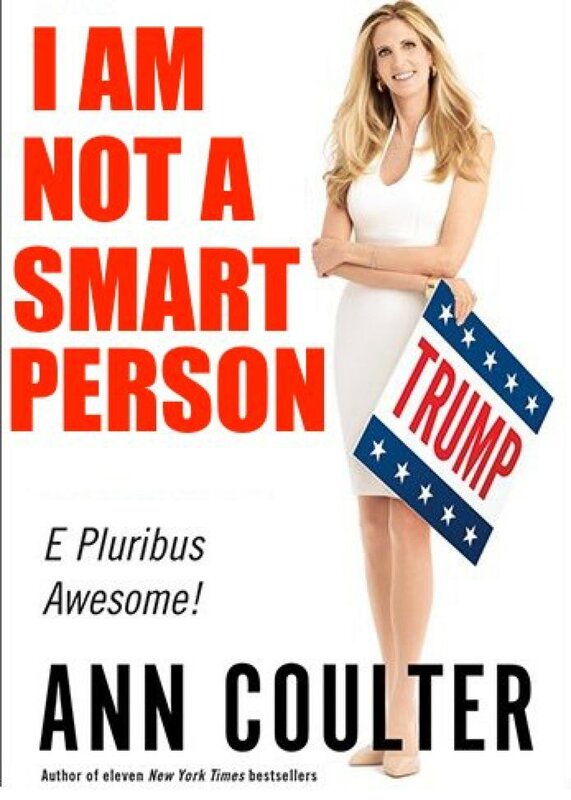 See “Coulter Proud to be Leni” at http://wp.me/p4jHFp-eB.